Jean Villamartin Jasmin, age 46, passed away peacefully on Wednesday, December 12, 2018, at the High Prairie Health Complex. She was born October 16, 1972 in Manilla to Julieto and Helen (née) Rojo. 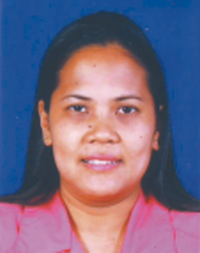 She graduated from Catanduanes State College in 1995 as an RN, and later worked in Saudi Arabia for five years. In 2007, she came to Canada and worked as a caregiver in Valleyview. Upon completing her three years there, Alberta Health Services hired her as a health care aide. Jean was predeceased by her father, Julieto. Jean is survived by her mother, Helen; her husband, Claude Jasmin; children, Xyruss, Ralph and Julieto Job; her brothers, Rod, Ray and Ritz; as well as numerous uncles, aunts and cousins. Eucharius Ndzefimitigsdv officiated and Xyruss Bonaficio was the crossbearer. Laurent Jasmin, Henri Forcier, Dwight Salahub and Craig Salahub were the arkbearers. Aileen Garcia, Vilma Fidler, Quincy Geruino, Aileen Coogman, Mary Jane Rebamonte and Florence Nalo were the honourary pallbearers. From her birth to her death, she nourished family, friends, co-workers and clients with dedication and unending love for all. She will be dearly missed by everyone.